GOYANG, South Korea -- North Korean leader Kim Jong Un walked across the border Friday and met South Korean President Moon Jae-in. It's the first time a member of the Kim dynasty has set foot on southern soil since the end of the Korean War in 1953 and the latest bid to settle the world's last Cold War standoff. Moon's senior spokesman said Kim joked to he would make sure not to interrupt Moon's sleep anymore, apparently referring to the North's series of early morning missile tests last year. Moon's spokesman says Kim also made a reference to a South Korean island that became a target of a North Korean artillery attack that killed four in 2010. Kim says the residents of Yeonpyeong Island who have been living under the fear of North Korean artillery attacks and also families separated by the 1950-53 Korean War have high hopes for the inter-Korean talks to help heal past scars. Kim also said he would visit Seoul's presidential Blue House if invited. As of noon local time, Kim and Moon had finished the finished the morning session of their summit at a border truce village. Television showed bodyguards jogging beside Kim's black limousine as it rolled back to the northern side of the Pamunjom where Kim and other North Korean officials participating in the summit are expected to have lunch. Seoul also said Kim described the country's transport conditions as poor as he and Moon discussed Moon's potential visit to the North. CBS News' Ben Tracy reports the two will talk deeply about denuclearization. The White House issued a statement after the meeting saying "we are hopeful that talks will achieve progress toward a future of peace." "We wish the Korean people well. We are hopeful that talks will achieve progress toward a future of peace and prosperity for the entire Korean Peninsula," the statement read. "The United States appreciates the close coordination with our ally, the Republic of Korea, and looks forward to continuing robust discussions in preparation for the planned meeting between President Donald J. Trump and Kim Jong Un in the coming weeks." Isaac Stone Fish, CBSN contributor and senior fellow at the Asia Society, explained the significance of this event. "It's certainly incredibly significant to see these two men meeting with expectations of peace being so high," Fish said. "I think a lot of people have talked about the shift of where we are today and where we were several months ago. It's important to remember that even though the two leaders are smiling and posing with children ... it's very possible in a few months from now, tensions will go back to where they were." "It's hard to know how much credit to give to Trump's sanctions and his 'maximum pressure' policy and how much credit to give to Kim Jong Un -- the North Korean dictator feeling secure at home, feeling that he's consolidated enough power domestically, feeling that he now has enough of a nuclear weapons arsenal that he can negotiate -- if not from a position of strength -- a position that he's comfortable he'll be able to stay in power," Fish added. With a single step over a weathered, cracked slab of concrete, Kim made the historic trip Friday by crossing over the world's most heavily armed border to greet his rival Moon for talks on North Korea's nuclear weapons. Kim then invited Moon to cross briefly north with him before they returned to the southern side. Those small steps must be seen in the context of the last year -- when the United States, its ally South Korea and the North seemed at times to be on the verge of nuclear war as the North unleashed a torrent of weapons tests -- but also in light of the long, destructive history of the rival Koreas, who fought one of the 20th century's bloodiest conflicts and even today occupy a divided peninsula that's still technically in a state of war. It was all smiles Friday as Moon grasped Kim's hand and led him along an blindingly red carpet into South Korean territory, where school children placed flowers around their necks and an honor guard stood at attention for inspection. Beyond the surface, however, it's still not clear whether the leaders can make any progress in closed-door talks on the nuclear issue, which has bedeviled U.S. and South Korean officials for decades. North Korea's nuclear and missile tests last year likely put it on the threshold of becoming a legitimate nuclear power. North Korea claims it has already risen to that level. Kim's news agency said that the leader would "open-heartedly" discuss with Moon "all the issues arising in improving inter-Korean relations and achieving peace, prosperity and reunification of the Korean peninsula" in a "historic" summit. It's the first time one of the ruling Kim leaders has crossed over to the southern side of the Demilitarized Zone since the Korean War ended in 1953. The greeting of the two leaders was planned to the last detail. Thousands of journalists were kept in a huge conference center well away from the summit, except for a small group of tightly-controlled pool reporters at the border. Moon stood near the Koreas' dividing line, moving forward the moment he glimpsed Kim appearing in front of a building on the northern side. They shook hands with the border line between them. 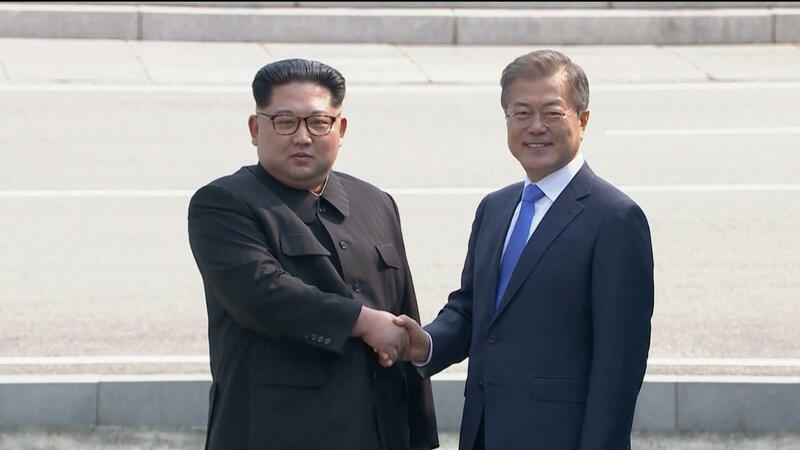 Moon then invited Kim to cross into the South; Kim invited Moon into the North, and they then took a ceremonial photo facing the North and then another photo facing the South. Two fifth-grade students from the Daesongdong Elementary School, the only South Korean school within the DMZ, greeted the leaders and gave them flowers. Kim and Moon then saluted an honor guard and military band, and Moon introduced Kim to South Korean government officials. Kim returned the favor with the North Korean officials accompanying him. They were to take a photo inside the Peace House, where the summit was to take place, in front of a painting of South Korea's Bukhan Mountain, which towers over the South Korean Blue House presidential mansion. Expectations are generally low, given that past so-called breakthroughs on North Korea's weapons have collapsed amid acrimonious charges of cheating and bad faith. Skeptics of engagement have long said that the North often turns to interminable rounds of diplomacy meant to ease the pain of sanctions -- giving it time to perfect its weapons and win aid for unfulfilled nuclear promises. Advocates of engagement say the only way to get a deal is to do what the Koreas will try Friday: Sit down and see what's possible. Moon, a liberal whose election last year ended a decade of conservative rule in Seoul, will be looking to make some headway on the North's nuclear program in advance of a planned summit in several weeks between Kim and U.S. President Donald Trump. Kim, the third member of his family to rule his nation with absolute power, is eager, both in this meeting and in the Trump talks, to talk about the nearly 30,000 heavily armed U.S. troops stationed in South Korea and the lack of a formal peace treaty ending the Korea War - two factors, the North says, that make nuclear weapons necessary. South Korea, in announcing Thursday some details of the leaders' meeting, acknowledged that the most difficult sticking point between the Koreas has been North Korea's level of denuclearization commitment. Kim has reportedly said that he wouldn't need nuclear weapons if his government's security could be guaranteed and external threats were removed. Kim and Moon will be enjoying each other's company in the jointly controlled village of Panmunjom near the spot where a defecting North Korean soldier recently fled south in a hail of bullets fired by his former comrades.